Three years ago, in 2014, the Tulsa Drillers fell in Game 5 of the Texas League Championship series to the Midland RockHounds on a rainy Sunday. Fast forward three years to 2017 and the Drillers found themselves in an eerily similar situation. After rain delayed the start of Sunday night's Championship game 1 hour and 13 minutes, the Drillers found themselves down 1-0 early. 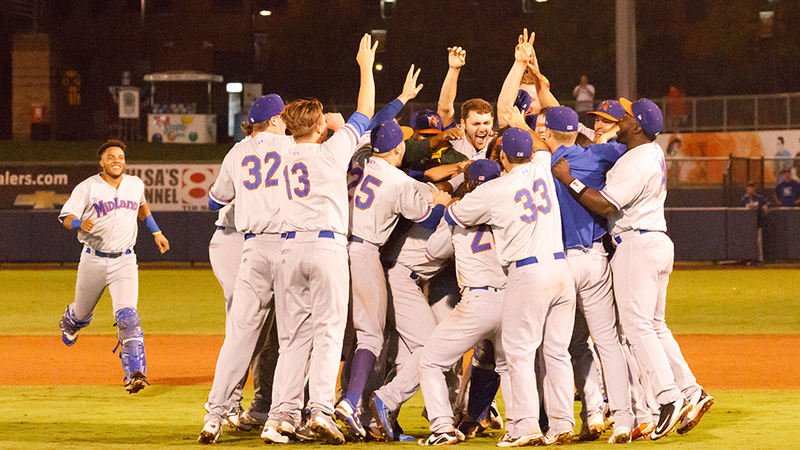 And unfortunately, they would be unable to come up with the big hit to tie or win the game as the RockHounds claimed their fourth straight Texas League title with a narrow 1-0 victory at ONEOK Field. The season-ending loss dampened an otherwise outstanding 2017 campaign for the Drillers. The club set the franchise record for most home runs as a team with 168 while also setting the Tulsa professional baseball record with 15 consecutive home wins. Matt Beaty won the Texas League Player of the Year honor while also becoming the first Driller in franchise history to win the league's batting title. And four different players on this year's club made it all the way to Los Angeles for their big-league debuts. Sunday night's game went down to the wire as the Drillers came within one swing of the bat of winning their first Texas League Championship since 1998. After Tulsa closer Daniel Corcino held the RockHounds in check in the top half of the ninth, the Drillers had one final chance to win the Texas League title as they went to the bottom of the ninth trailing 1-0. Facing Midland closer Kyle Finnegan, who was pitching for the third straight day, both Kyle Garlick and Blake Gailen were retired on pop flies for the first two outs of the frame. But Erick Mejia reached base on a swinging strike three that got away from the RockHounds catcher to bring the potential winning run to the plate in newcomer Keibert Ruiz. But Finnegan was able to get Ruiz to ground out to second, securing Midland's fourth straight Texas League championship title. The RockHounds took advantage of a miscue on the first play of the game to take an early advantage. Jorge Mateo led off the game with a grounder towards shortstop that third baseman Mejia fielded on the move before making an off-balance throw that sailed wide of first base. Mateo scampered to second on the misfire before coming home to score three batters later on an RBI single by Texas League RBI leader Viosergy Rosa to put Midland up 1-0. The Drillers threatened to tie the game in the home half of the first as they put men on first and second with one out against Midland starting pitcher James Naile. But Naile set the tone for the night as he was able to escape the jam by inducing groundouts from Garlick and Gailen who had been Tulsa's hottest hitters in the Championship Series coming into the night. From there, both Naile and Tulsa starter Dennis Santana matched each other with scoreless frames over the next five innings. The Drillers appeared to have something cooking in the fourth as Beaty and Garlick led off the inning with back-to-back singles. But Naile got Gailen to ground into a double play and then struck out Mejia to maintain the RockHounds slim advantage. Midland looked as if it would capitalize on the momentum from that as the visitors loaded the bases on a double, a hit batter and a walk. But Santana was able to retire the red-hot Sheldon Neuse on an infield fly and then struck out J.P. Sportman to keep the Tulsa deficit at 1-0. Both managers turned the game over to their bullpen in the seventh inning after outstanding performances from both starting pitchers. Brian Moran and Corey Copping combined to toss a scoreless top of the seventh for the Drillers as they worked around a single from Max Schrock and an intentional walk to Neuse to keep the score at 1-0. For Midland, reliever Tyler Sturdevant kept the Drillers at bay as he set Tulsa down in order in the bottom half of the frame. In the top of the eighth, Layne Somsen got the first two outs, sandwiched around a one-out single from Sean Murphy, before Corcino came in to retire Jorge Mateo for the final out of the frame. The Drillers got a man on second in the bottom of the eighth against Joel Seddon after DJ Peters walked and was moved to second on a sacrifice bunt from Errol Robinson. But Yusniel Diaz grounded out and Beaty was retired on a swinging strikeout from southpaw Brandon Mann to strand yet another runner in scoring position for Tulsa. That would lead to the ninth where Midland would hang on to end the 2017 season. Santana was charged with the tough-luck loss as the right-hander allowed just the one unearned run over six innings of work. He struck out seven while only walking one Midland batter. Naile earned the series-clinching victory for the second straight year for the RockHounds with his six shutout innings of work. The Drillers will open the 2018 campaign on the road against the Frisco RoughRiders. The first game of the season will be on Thursday, April 5th at Dr Pepper Ballpark. Following a six-game road trip, the 2018 home opener will be on Thursday, April 12th at ONEOK Field. Thank you to all the Drillers fans who came out and supported the club during the 2017 season. It was quite the ride. We'll see you next year!